This recipe is for an individual serving of olive and herb grain-free FAUX-caccia (fake focaccia, get it? hee hee). I cooked it in the microwave so it took less than 5 minutes to make. This fake focaccia is my own variation of “Low Carb Bun For One” from Free Range Cookies. I found Linda’s site a couple days ago and was intrigued by making individual servings of grain-free breads in the microwave. (You can also bake it.) I happened to have the ingredients (mostly) on hand, so I made the bun for one and it was decent! I didn’t have any coconut milk on hand, so I used 1/2 tablespoon coconut cream and 1/2 tablespoon of water instead. The bun came out tasting a little more like coconut flour than I would have liked, but that could have been because of my substitution. Had I followed the recipe exactly, maybe the taste would have been “great”. But I used it to make a delicious sandwich with mustard and that covered the taste, so I didn’t really care. On the Bun For One page, Linda linked to her recipe for focaccia. I love focaccia, but obviously don’t eat it anymore because of having to avoid grains. I couldn’t try her recipe because I don’t use yeast or “gluten-free flour blends” or guar gum. But I noticed that the oil in the focaccia is olive oil rather than coconut oil so I hatched a plan. I replaced the coconut oil AND coconut milk in the Bun For One recipe with olive oil and then topped it with Herbes de Provence and some chopped up olives instead of sesame seeds. I know Herbes de Provence is a French blend, not Italian, but it’s what I use in my salad dressing and really like the flavor. You can also use just rosemary or any herbs you want. I also like olive breads, so I decided to include chili pepper stuffed olives (not pimiento – actual spicy chili peppers). Obviously this isn’t going to be as bread-y as something with yeast in it. 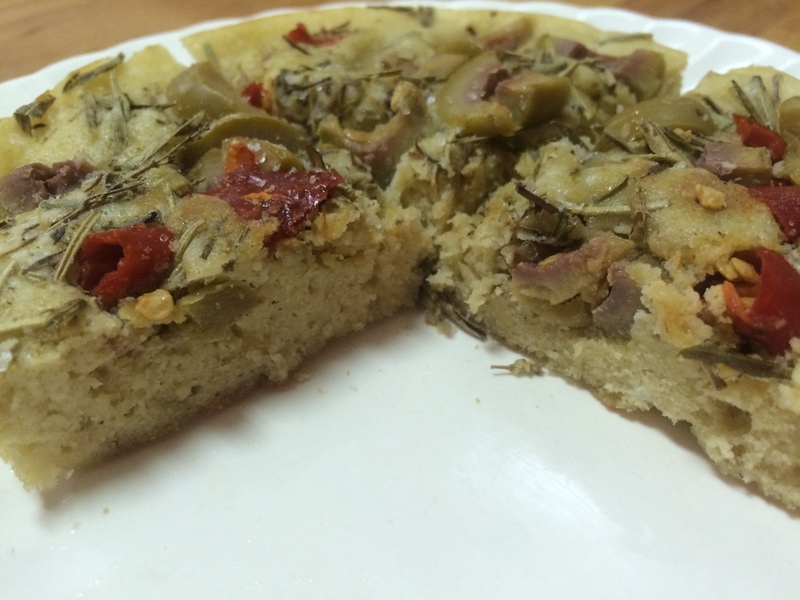 But the experience was focaccia-ish and olive bread-ish and that is good enough for me. I whisked everything except the toppings together in the ramekin I cooked it in. Fewer dishes! Then I rubbed oil around the sides of the dish above the batter so it didn’t stick if it puffed up while cooking. I sprinkled the salt, herbs, and olives on top before cooking, so they’d bake into it. If you’re using brined olives, go easy on the sea salt. Linda suggests using a 4″ round microwave safe ramekin to cook this in the microwave at full power for 55-60 seconds in a 1500 watt oven. As with everything cooked in a microwave, cook time varies based on the power of the microwave. 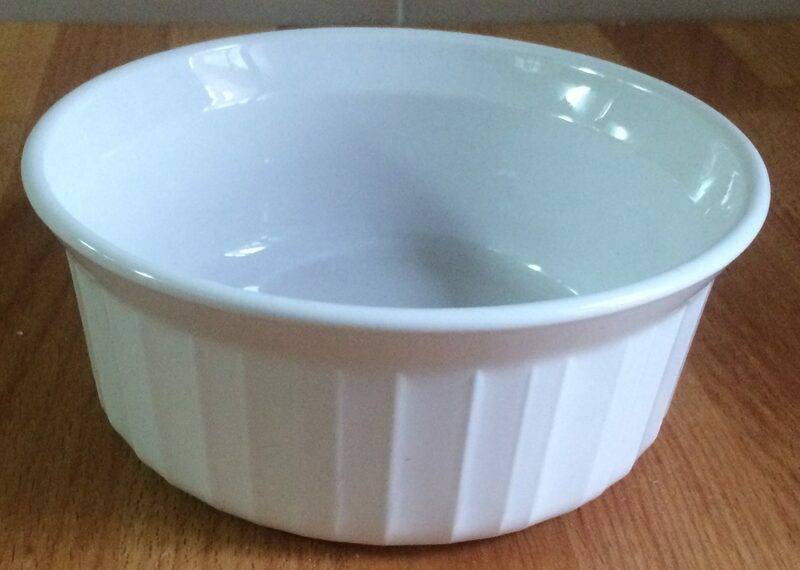 My ramekin is 4.5″ in diameter across the bottom, so the bread comes out not quite as thick, but that’s OK. The first couple times I made this, I cooked it for 60 seconds and it was cooked through. Then I discovered our microwave is 800 watts, so I tried 2 minutes just to see what would happen and it was maybe a little overdone. The fourth time I made it, I cooked it for 90 seconds and that was probably my favorite. Please see Linda’s original recipe for baking instructions. I haven’t tried this in the oven so I don’t want to make any suggestions about baking. She also has a suggestion for making two rolls instead of one bun (including decreased cooking time). So when it came out of the microwave, I browned the top and bottom on a non-stick pan. I didn’t time it, but it was probably less than 2 minutes total, on low heat, starting with a cold pan. If I’d have started heating the pan while the bread was in the microwave, it probably would have been even faster. Good luck! And let me know what you think if you make it. Linda also has a recipe for a Rye-Style Bun For One that I want to try. I just don’t have any cocoa powder on hand. Let me know if you make that one too; I’m curious!